Hello Joe McG and all the good people. Hey, Destroit and Coalcanth. Hard work following Martha, but I'll do my best. Y'all well? Destroit, Turn your head each day, so satisfied, I'm on my way! i'm sure some folks on Martha's comment board would appreciate that my math question just then =666. (yes,i answered it correctly) ...Yes Joe.I'm well. I hope you are well as well. So you got the 666 math question? It's now official: the Apocalypse can begin! Joe is being WAY too modest here, please ignore him w/rt those words - and I can't believe I missed on this Paul Ngozi lp! I feel this guy. Hippies are ALWAYS trying to kill me. i love all the chrissy zebby tembo songs about pirates. hippies and pirates. scary. Martha, the Hippies are trying to kill us! That was some sweet Afro fuzz. P.S. Shoulda worn your skull earrings like I TOLD you to! The Chipmunks go prog? I didn't believe in the Apocalypse before, but it's the only explanation. @Martha: I know! I thought this Terre T T-shirt would be enough! Hi Joe & all! Desperately trying to listen on new phone (finally, reluctantly retired vintage flip phone) but connection & app wonky at moment. Joe, DID listen to your show from 2 weeks back whilst walking dogs today, that was wonderful. OK, off to try to listen to *this* show, cross your fingers. Hey, Droll! Hey, Holly! So cool that you're revisiting my back pages. With pup in tow! JOE- Here as always, enjoying the program my Friend! Cheers!! Hey, CS! Great to see you yesterday, as always! Ooh wee. This is good stuff Joe. Cool! Thanks, Rob! Hey, amEdeo! Teeth brushed,skull earrings in,ready to take my chances with the hippies and the apocalypse.The dogs should keep the scary chipmunks away...The first set Rocked! I'll return for the archives,if i should survive. Thanks! Goodnight. Thanks, coelacanth. Be safe from the hellhounds and the hippies! Hah. Watching the night sky online. Strange and wonderful times. Where is my Egg Cream? It's next to the Big Dipper. Mademoiselle Kitty, nice to see you at this ungodly hour of the apocalypse. Marmalade Kitty you did make it, so glad! Love the Olympics. Struggle with the coverage, but it's always a great fall back watch on the TV. JMcG, Whoa -- I have to say the fact there's 43 images leans much more towards terrifying than hilarious. Clown-like makeup seals the deal for me. Images 30-31 must represent some fetish from daytime TV I'm not familiar with. I saw the Michael Phelps monkey faces! @Holly: What was the name of that smirking girl? On top of everything else, love me some Single File. McKayla Maroney, who, ad noone now comments, performef a friggin perfect bault in the all arounds, simply stunning. Someone needs to find the diver faces! Texting novice apologies. Sadly dead sober! Diver faces, someone! I've found the creepy swimmers and monkey faces, so I've done my part. Is anyone else dead sober? Joe, So glad you're a woman creeped me out. 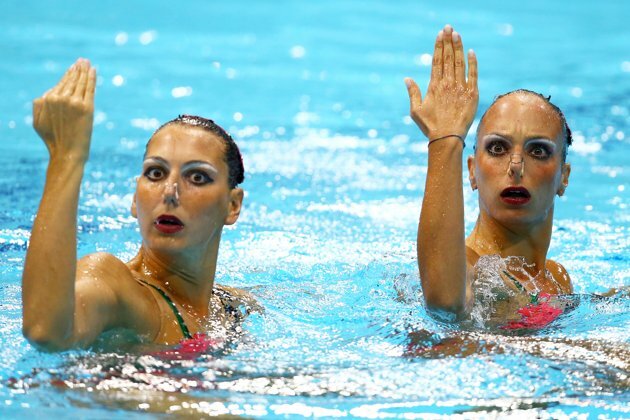 Diver faces, people who can Google! @Holly: It creeped me out, too! @Julie: Hey, Julie! Hi Julie! Has your stalker been banned? You're welcome. I wasn't planning on sleeping tonight anyhow. So I'm dogsitting & somehow said dog has snugglef me into a ~6inch corner of a truly huge bed - I mean bigger than most refugee rafts big. Sigh. And he's snoring. And I love him. Mornin' Joe. See you nearly had a complete set of bracketed singles. @Holly: Swamp Dogg to Snuggle Dogg. this whole Rodriguez album, Cold Fact, is great. Has anyone seen the Rodriguez doc? Looks wonderful. @Brian: Morning, Brian! @david: I agree, a classic! @Holly: Dying to see it, haven't had a chance yet. Blind Willie is...I have no words. I could play his records all night. And I would happily listen. Thanks for listening tonight, everyone! I had a great time as always....Have a fine, fine week! Sounds like a great show, Joe. Have a great week Joe, Holly, listeners.